I’ve already been in Bali for four days but I haven’t had a chance to post anything until now. I arrived on Sunday afternoon local time after 22 hours in transit from LAX. My son Collin and his friend Reme travelled with me and the flight was actually pretty good – I was able to grab an exit row seat for both legs which makes a big difference when you’re tall. We had a lovely dinner the first night which gave us a chance to catch up with my wife Kathryn and her friends who had arrived about ten days earlier. 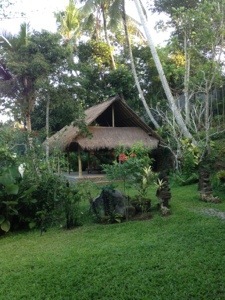 We are staying in a fabulous new villa that lies near Ubud, a major cultural center. All eight of us are enjoying the luxury before we head up to the mountains for more basic accommodations. Our schedule the first day was hectic but fun. We got up early and rode mountain bikes through small villages and rice fields into Ubud. The trip took us along local narrow roads and even some footpaths with occasional stairs. After the bike ride we hopped in a raft to continue our journey down a small local river. 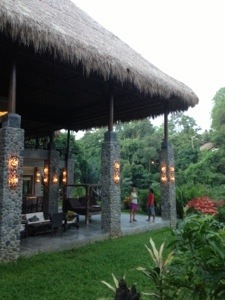 We finally rolled back into Ubud around 4 pm and dropped into a day spa for a massage. needless to say we were cooked after all that activity and jet lag. But our day wasn’t over yet. That evening we went out to dinner and a traditional dance show. Luckily it lasted only 45 minutes so we got to bed at a decent hour. So here’s a brief aside on what it’s like to be in Bali. I’m writing on the patio of a nice hotel in the Munduk mountains region. The room costs $20 per night. We just had lunch for 4 persons and paid $20 with tax and service included. Now here’s the best part. As I’m sitting here enjoying the stunning green mountains and distant Bali Sea, I’m watching two guys in the tree about 30 feet away. They’re picking cloves while standing on single pole ladders about 30 feet off the ground. They have large white bags which they are filling with cloves that they pick individually. As they work, they chat amiably back and forth. The best part about Bali is the people. On our second day in Bali we arranged an early morning trip to Tirta Empul, one of the most sacred places in Bali. We arrived around 7 am, before the crowds and vendors turn the grounds into a circus of humanity. In the early morning, the ritual of purification is free from distraction. Our friend Wayan is joined by his sister and together they become our spiritual directors for the morning. First, we prepare our offerings of flowers and incense before entering the two pools. We are clothed in traditional sarongs and enter the cool water carefully to avoid the stone bottom and resident small fish. At each spout that enters the pool, I pray for a different intention – my relationship with Kathryn, the welfare of our children, my new business venture. I pray for our friend Wayan, my mother in Arizona and my wife’s parents in San Diego. I find that each spout eases my tension and acceptance fills the space instead. After leaving the pools, we move into the inner temple grounds to make our final offerings and prayers. Before going to the temple, I was tired from the long trip and hesitant to get up early and return to a place I had been twice before. As I left the grounds, I realized it was an important step on my journey of letting go. To emphasize the point, we heard the clatter of workers and equipment as we left. We had arrived before a major maintenance project that would have prevented us from our ceremony. The circus had begun. This entry was posted in Travel by rambler1959. Bookmark the permalink.